Erin Blegen: My Scrap Cabin: "Simply the Best": Webster's Pages 'Best Friends'~!! "Simply the Best": Webster's Pages 'Best Friends'~!! Good morning, my dear friends! And Happy Monday~!! I know, I know- you're sayin' "MONDAY? HAPPY?!" Yes, I understand that Monday is generally the most loathed day of the week- but I've got something to cheer you up, okay? 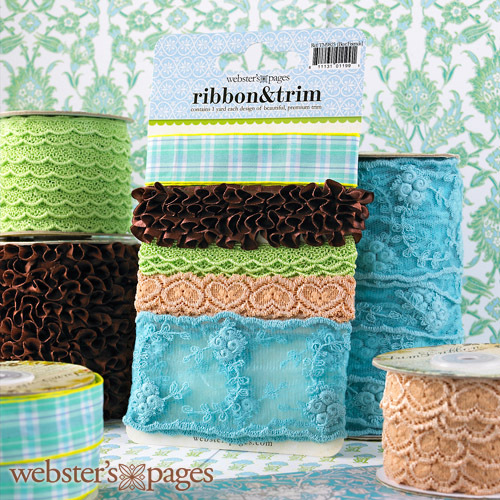 Because today I get to share with you my very first project using the GORGEOUS "Best Friends" mid-release collection from Webster's Pages!! This range is just REFRESHING~!! As I look outside at the now bare trees and gray skies, cold winds and snow flurries- let me tell you, I NEED something as fresh and fun as "Best Friends" :)~! And how could I NOT dedicate my very first project to my own best friend AND sister, Kelly?! Many of you know her through her talents as a scrapper, but only I REALLY know her, as a best friend should! We've been through EVERYTHING together- both good and bad. We literally call each other probably a minimum of 20 times a day- even if it's just to say "Hey, I had to tell you before I forget..." and then hang up thirty seconds later. Between handling kids and daily life, we're on and off the phone pretty regularly, haha! I knew I wanted this beautiful willow tree with the long, beautiful branches and falling hearts as the main element on my layout. Then the white bracket section of the paper was also cut out to be used on this page as well. (The dog and child were cut out and set aside for a future project). Aren't these polaroid frames just adorable?! They're a trend we're continuing to see used and I think they are just way too cute! Paired with a digital frame added to my photo and topped with a fabulous window piece from Scrap FX, It was time to top off the entire works with the beautiful resin heart piece! Who doesn't adore the Webster's Pages cameos? 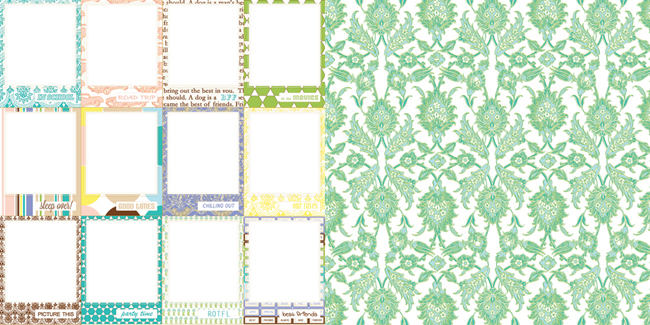 And Brandin really has outdone herself with these- I think they're the most beautiful yet! I hope you take a moment to think about your own best friend~! Whether it's your own sister, your husband/wife/significant other, one of your children~ whoever. Take a moment to tell them how much they mean to you! And, of course if you're looking for the perfect collection to scrap that very special person, get in on the pre-order action today!! wow! This is really beautiful! I love the tree mixed in with those layers. So whimsical and gorgeous! So many beautiful things about this layout...the photo is amazing, the colors are divine, and the design is super fabulous! it is so beautiful your layout. Lovely colors. Erin, you scrapped this beautifully. gorgeous work!!! love the new line! This is so gorgeous, Erin! I'm totally loving the green vine in this...beautiful fussy cutting! The blues & greens really pop on these papers. Amazing page! That photo is ancient, lol! Look how young and dolled up we are! 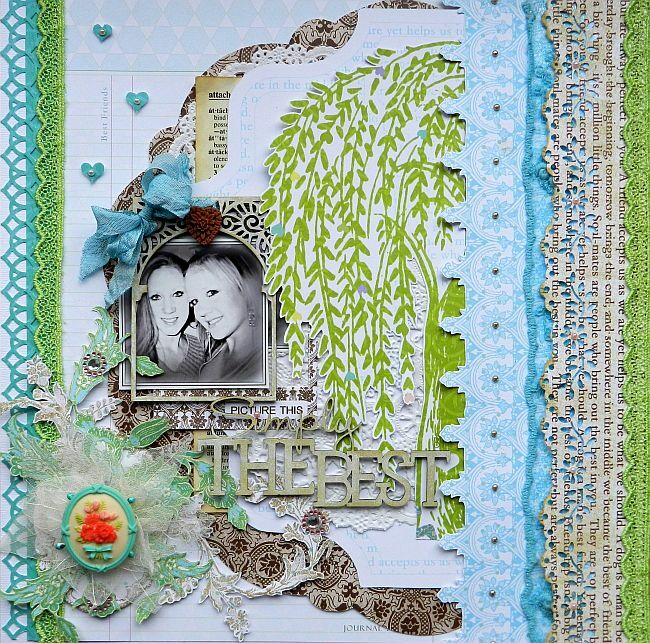 Your page is gorgeous, the willow tree and the frame are awesome! What a great collection. Skønne farved, dejlig lag på lag, og to smukke unge piger på fotoet, du laver et smukt arbejde. knus morkaren. Gosh, your layout is simply gorjuss:) So love the colours and the branches on the right side. A beautiful friendship lay-out! This is so pretty! I thought your fussy cutting was a diecut! The colors are so fresh and cheerful. I can tell you and Kelly have a lovely relationship. I too have a great sis and we are the best of friends but she lives very far from here! I love the look of the new collection and also how you have used it. 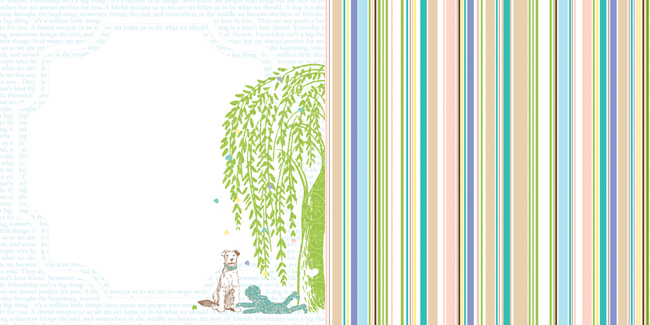 Your fussy cutting is always such an inspiration and that willow tree looks so refreshing,.... like you say! :-)Also love all the chipboard goodies. Have a lovely day!! HI.. What a wonderful and beautiful layout, and how lovely to have such a close relationship with your sister.. that is a real blessing!! Oh wow! This is such a neat looking page. Love it! 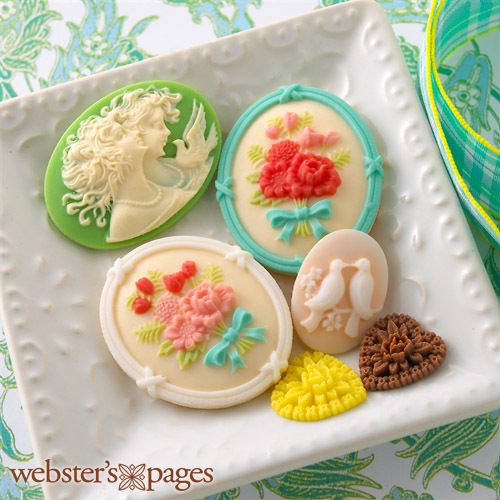 Love all those fabulous layers and those cameos are irresistible!!! Love the beautiful colours and details ! I love so many things here--that cameo is a work of art! I like the resin heart also, and the colors here. You are so lucky to have your sister as your best friend--your love for each other really shows! I love what you did with the willow tree! Awesome page! One of my faves lately!